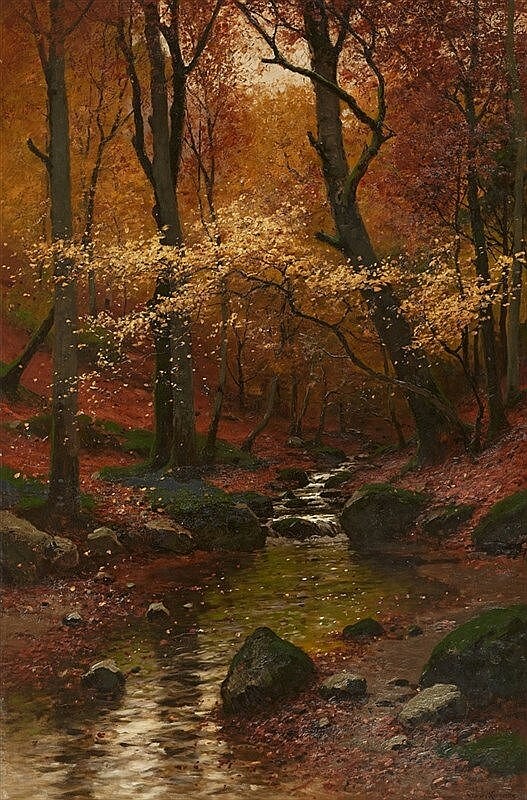 With crisper weather, golden and red leaves in the fall months, we explore the work of three German painters who captured the beauty of the season. Joseph Wenglein is one of the last important artists of the Munich school. Quitting his education in law, Wenglein trained as a painter at the Munich Art Academy, under the direction of Adolf Lier. His Naturalism is instantly recognizable, focusing on landscapes which are unspoiled by humankind. 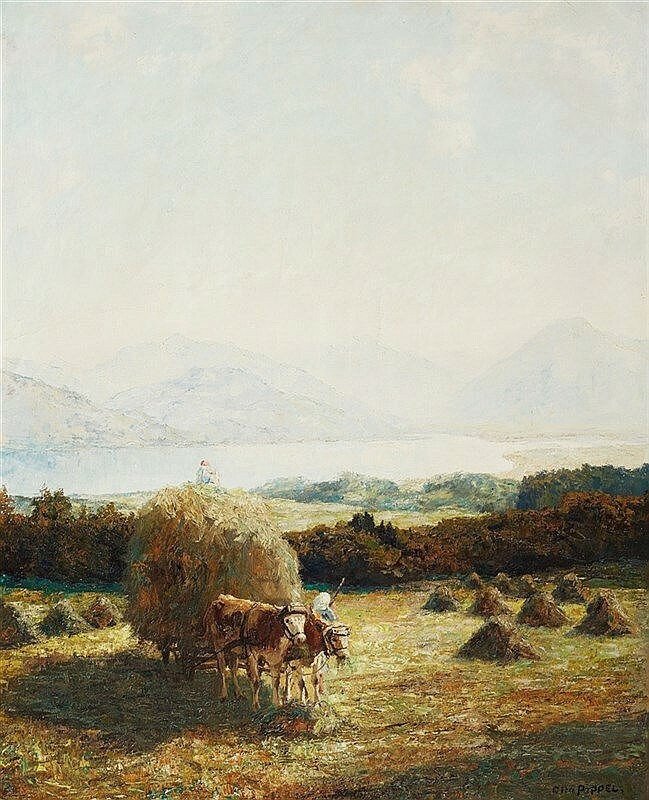 His most beloved spots to paint were the Bavarian plateau and the surrounding area of the Isar River, he is considered to be one of the last representatives of Munich plein-air painting. Pale daylight, dense fog and a sense of warm and heavy airs are all motifs in Wenglein's oeuvre. Today, in Munich's Neue Pinakothek hangs a secret masterpiece by Wenglein entitled Die Kalkstein Sammler in der Isarbett, 1883. The piece showcases wonderfully Wenglein's talent for capturing light and shadow, as well as the warmth of the sun in the mountains. Wenglein would often paint with a palette of five base colors: ochre, an earthy red and blue, all mixed with black and white. Leaves, water, mountains and trees would all be created using these colors. Konrad Alexander Müller-Kurzwelly is also best known for his Naturalist pieces. He was taught by Hans Fredrik Gude at the Berlin Academy from 1881-1885. Alongside his contemporaries Friedrich Stahl and Hugo Schnars-Alquist, Müller-Kurzwelly exhibited at the 1891 Berlin Salon. The following year, Müller-Kurzwelly along with Walter Leistikow and Ludwig von Hofmann, founded the Vereinigung der XI art group. As Wenglein did, Müller-Kurzwelly wanted to capture the sensuality of nature as an escapism for Berliners living in the hustle and bustle of the growing city. Sadly, much of the artist's work was destroyed in bomb attacks on Berlin during World War II. Today, his works can be seen in Prague, Riga, Kaliningrad and Breslau. A small selection of his paintings are in the collection of the Berlinische Galerie. From Naturalists to Impressionists, Otto Pippel is regarded as one of the most important of the Impressionists from Southern Germany. He studied at Straßburg's School of Applied Arts in 1896. His studies were interrupted when he was drafted into the Russian army for four years. On his return from the army, Pippel travelled to Crimea, Munich and Paris. In Paris he was enthralled by the works of the French Impressionists which lead him to consider and develop his use of light. In 1912, Pippel joined the 'Luitpoldgruppe' and exhibited his first work, a small winter landscape, at the Munich Glaspalast. From 1915, he had regular exhibition at Munich's Galerie Brakl. Pippel was a master of color, his landscapes and Still Life works were rich and sumptuous. His oeuvre is made up of motifs associated with Munich: the Hofgarten, the Englischer Garten and the Hirschgarten. Otto Pippels works are in the collections of the Städtische Galerie Lenbachhaus and the Städtische Galerie Rosenheim. All works featured will hit the auction block at Lempertz on September 20 in their Paintings 15th-19th century. Check out the full catalog here.